Every year Calgary paramedics respond to traumatic emergencies where helmets have prevented a serious injury or saved a life. Bicycle crashes are the leading cause of brain injury in school aged children. The majority of bicycle injuries do not involve motor vehicles. Most often injuries occur when a cyclist suffers a fall, strikes a stationary object like a pole, or collides with a pedestrian or another cyclist. 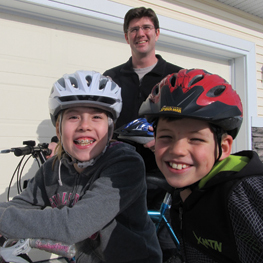 Unfortunately there are still a significant number of people that do not wear helmets, however it is Alberta law that anyone under 18 years of age must wear a helmet when riding a bicycle. It is also highly advisable to wear a CSA approved helmet when using a skateboard, in-line skates, or a scooter. • Allow children to assist in choosing their own helmet– cyclists who choose their own helmet are more likely to wear them. • Make a habit of wearing helmets early, even if young children are learning on a tricycle. • One simple rule: no helmet, no cycling. Make the rule and stick to it consistently. • Lead by example– always wear your own helmet! • A helmet that has been in a crash must be replaced, even if it appears undamaged. • Replace your helmet every five years even if it hasn’t been in a crash. UV rays will weaken the helmet over time. • The helmet should rest level on the head, never tilted high or low over the forehead. • The helmet should feel snug, but not too tight. It should not fall off when you shake your head from side to side while the straps are unfastened. • Adjust the chin straps to form a “Y” below and slightly forward from the ears. • Only one finger should be able to fit under the chin strap when it is fastened. • Use the sizing pads included with the helmet to improve the comfort and fit. • A brain injury is not like a broken bone – it may never fully heal. • A brain injury can lead to permanent disability or death. • The cost of a helmet is easily justified. Research demonstrates wearing a helmet can reduce the risk of brain injury by 85%. • Statistics show that all cyclist fatalities in children under the age of 15 were unhelmeted. • Remember: all cyclists’ crash eventually! • Calgary paramedics are doing their part– every year the Calgary Paramedics Charity Society gives away 500 bicycle helmets to less fortunate children. This entry was posted in Uncategorized on February 22, 2017 by Calgary's Child. Valentine’s and Family Day Fun! February 14, 6 to 10pm. Love and Courtship in the Wild. Get all dressed up for In the Heat of the Night, the Calgary Zoo’s annual adventure into the world of critter romance. Enjoy a romantic Valentine’s dinner in the ENMAX Conservatory, with unbeatable ambience. After your meal, the Zoo will start their special presentations on courtship and mating in the animal world. For more information and to purchase tickets, visit the website. The Calgary Zoo ENMAX Conservatory – 1300 Zoo Road NE. February 18, 10am to 4pm. Kick off the Family Day Weekend at FISHtival! There will be free outdoor activities, including casting games, ice fishing safety, and marshmallow roasting. Warm up inside the Discovery Centre with even more fishy fun – including crafts, games, and prizes – at a special rate of $5 per person. Due to capacity, no strollers allowed. Free for children 3 and under. Bow Habitat Station: 1440, 17A Street SE. Website. Puppet Pop-Up Studio: Veggie Puppets! February 18, 1 to 3pm. Do you like playing with your food? What can you make from a zucchini? Or a potato? A puppet, of course! Make a puppet from an array of provided vegetables and act in the group’s tall tale about gardening. Take your puppet home to either eat or compost. Donations to the Food Bank kindly accepted. Please note that children and teens must participate with an adult! For ages 4+. 1204 89 Avenue SW. Website. February 20, 12pm to 4pm. 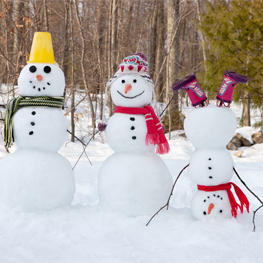 Enjoy your Family Day at Shouldice Aquatic Centre & Shouldice Arena! There will be free outdoor activities, hot chocolate, swimming, and skating! This entry was posted in Uncategorized on February 6, 2017 by Calgary's Child.